Spike Lee, now a man in his sixties, has made the finest film of his career; there’s historical balance; the anger is prevalent but tempered with an over forty-year perspective; intelligence informs the true story of African-American, Ron Stallworth’s infiltration into the Ku Klux Klan. It is the 70’s and the era is ripe with racial divisiveness; frustration from the black populace, wanting their righteous place in America, they have earned it, in addition, fueled by the assassinations of their inspirational leaders; simultaneously the underbelly of white supremacy seethes with fear of the intellectual uprising of the African-American intelligentsia. College campuses are hotbeds of discontent, raging breakdown of civilities, archaic standards smashed, blood willingly, brazenly spent. 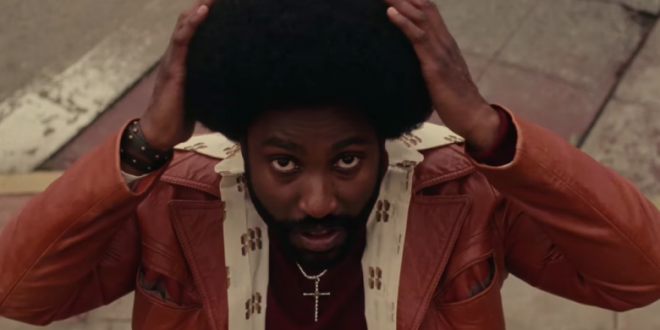 Ron Stallworth is the first black detective in the Colorado Springs Police Department; John David Washington (Denzel’s son) is dynamic as Ron, a performance proportioned perfectly with obsequious presumptiveness; similar to “Sorry to Bother You” he speaks with a white man’s forked tongue; he seduces David Duke, Grand Master of the KKK with his racist, anti-semitic, “God Bless White America” rhetoric; he is stunningly convincing and must manufacture a white police officer to take his place and earn membership into the ignoble, inglorious KKK; Adam Driver, Flip Zimmerman, serves as Ron’s “shill” and is captivating in earning the respect of lethally ignorant, cunning members, especially “Felix” (frigidly, frighteningly sensational Jasper Paakkonen) who intuits Flip’s Jewishness. There is much to savor in this film: Topher Grace, slimily charming as David Duke; Laura Harrier, “Patrice”, Ron’s conscience and muse, as a college coed, fiery leader of the “all lives matter” movement; two impassioned speeches from diametric, ideological opposites: Alec Baldwin, “Dr. Kinnebrew Beauregard’s” scathing rant against the “other” and Harry Belafonte, “Jerome Turner”, relates the unjust, egregious, martyrdom of his friend. “BlacKkKlansman’s” blazing commencement with the iconic scene in “Gone With the Wind”, Scarlett’s walk through acres of dead Southern soldiers, end of a world, a culture; concluding with the horrific riots, devastation, racist demonstrations in 2017 and our President’s defense of the white nationalists in Charlottesville, Va. Without bludgeoning sensationalism Spike Lee directs as a spectator, observing, remembering, graciously allowing the viewer to divine their own suppositions, comparisons. Therein lies the greatness of “BlacKkKlansman”.